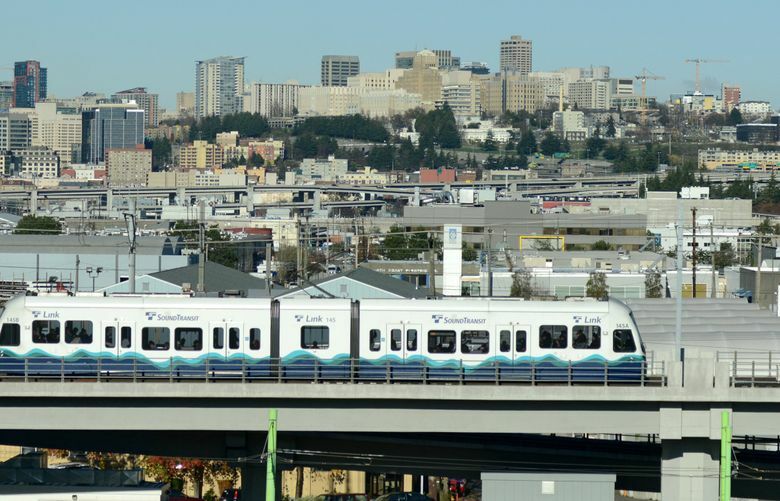 Commuting by public transit has hit an all-time high in the Seattle metro area, and we're also spending more than anywhere else to add more transit options. I heard from a lot of perplexed cyclists last week, after I wrote about new census data showing a dip in the number of Seattle bike commuters. That data doesn’t jibe with the experience of many local cyclists who told me their routes to work are more crowded than ever. I’m pretty sure, though, that I won’t get any pushback on this finding in new census data — especially from those of us who’ve squished onto a Metro bus or light-rail train lately. The number of area residents commuting by transit has surged to a record high in 2017, new census data show. More than 200,000 people in our metro area — a little more than 10 percent of the workforce — typically commuted by public transit last year. Since 2010, we’ve experienced the second-biggest increase in the share of transit commuters among the 50 largest U.S. metro areas, behind San Francisco. That’s even more impressive when you consider that in most urban areas, the share of commuters using transit has stagnated, or even gone down. Los Angeles and Washington, D.C., have seen the biggest declines. The reason that Seattle is bucking the trend is no mystery. We’ve invested more heavily in transit than any other region, and it’s paying off. Even before the passage of the Sound Transit 3 package, the Seattle area was spending more, per capita, on new transit projects than any city in the country. Why are we so willing to open our wallets for transit around here — and could it have something to do with demographics? That question came to me from Jonathan Hopkins, the executive director of Commute Seattle, a nonprofit funded by business and transportation agencies. There may be something to this theory. 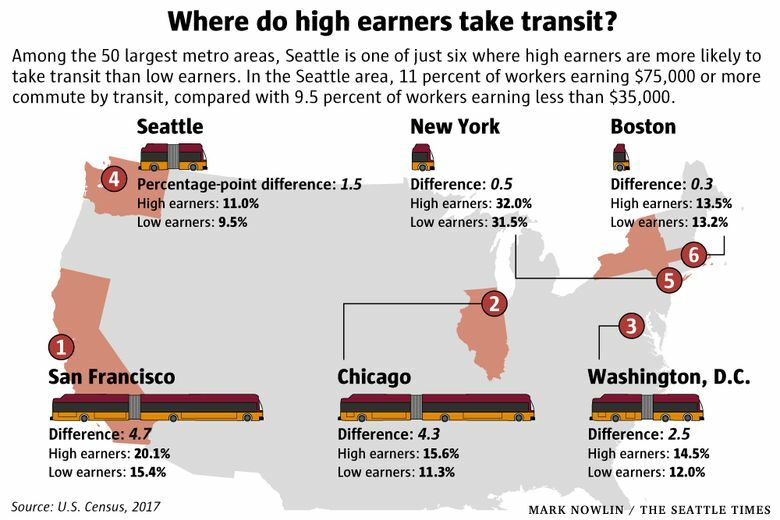 Census data show that Seattle is one of just six metro areas, among the 50 largest, where high earners are more likely to use transit than lower-income folks. Other areas where transit is much more heavily used by workers with lower incomes include Milwaukee; Buffalo, New York; Las Vegas, and — surprisingly — Portland. Less than 4 percent of high earners commute by transit in the Portland metro area, while more than 8 percent of low earners do. The census data also show that the biggest increase in transit commuting in the Seattle area was due to a huge jump in light-rail ridership. More than 12,000 commuters used light rail in 2017, a 66 percent surge from the year before. No surprise there. It was in 2016 that the light-rail stations on Capitol Hill and at the University of Washington opened, making the system far more useful to a whole lot of people. It’s likely this trend will continue as more light-rail stations open in the coming years.